C21Media is “Home to the International Entertainment Community, combining a portfolio of digital and print publishing brands with an events business and the world’s most powerful online content screenings marketplace. 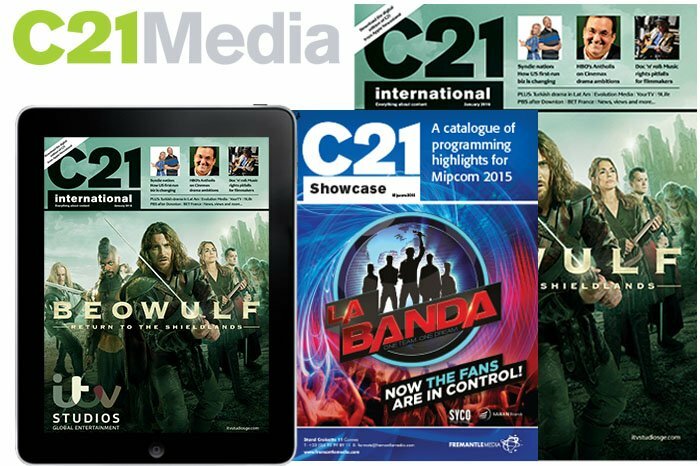 C21Media’s business includes print magazines, websites, iPad editions, reports, databases, events, a thriving internet TV division and an online content screenings marketplace. More than 180,000 top level executives engage with C21′s video, audio and written content each month. From those running major Hollywood studios and international channels, to small independent producers and distributors aiming to keep pace with the latest industry news, features and analysis. This community is the most powerful force in the international television, media and entertainment sector. Our market-leading website, launched in 2000, now attracts 180,000 unique users each month. We publish over 200 stories a week covering the global content business, and mix video and audio content with the latest shows debuting within C21Screenings. C21PRO is a multi-user subscription designed specifically for small businesses to enable full access to C21 news, features, reports and white papers, together with unique resources including the C21 International Funding Guide. Schedule Watch is a premium resource, providing detailed analysis of programming strategies at television channels worldwide. Daily channel profiles and regular updates advise of schedule changes and highlight programming opportunities. Schedule Watch is an invaluable data resource for rights owners aiming to develop global programming production, sales and distribution strategy. Publishing as a channel on C21Media.net and a weekly newsletter, C21Kids is also available as quarterly print and iPad edition covering the kids content sector. Publishing as a channel on C21Media.net, a weekly newsletter, a section within Channel 21 magazine, iPad edition and content partner for MIPFORMATS, C21Formats Lab is a leading information resource for the global formats business. Publishing as a channel on C21Media.net and a weekly newsletter, C21Factual is also a print and iPad brand covering the factual and documentary content sector. Publishing as a channel on C21Media.net and a weekly newsletter, C21Drama is also a print and iPad brand covering the global drama sector. A channel on C21Media.net and a weekly newsletter, FutureMedia is about the space in which technology and content collide. C21screenings is an online/mobile screening room providing new programmes global exposure to over 80,000 of the world’s most powerful content acquisition executives. It hosts over 2,400 trailers for more than 500 rights holders, who use its powerful suite of marketing tools to take their programming to market. 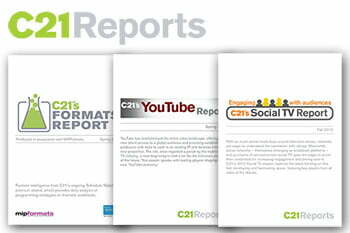 C21 publishes regular reports and in-depth white papers into the global content business. These run as papers published across a month and are then aggregated into complete PDF reports. C21’s in-house TV division makes programming for and about the international media and entertainment business. C21TV produces high quality programming that is recognised as ground-breaking by the global content business. This area of C21’s business has generated significant traffic and continues to grow rapidly. Channel 21 international is the market-leading business magazine for the world’s TV programming community. It’s recognised as a must-read for those producing, co-producing, acquiring, distributing and managing content to all types of channels – from TV stations to internet portals. Each issue is now published with a companion iPad edition and this digital and traditional media partnership has proved a major success. C21 for iPad includes all editorial and advertising from the related issue of Channel 21 together with ‘best of’ video and audio content from C21Media.net. Advertisers carry their creative through from the print edition and can supersize their ads with a number of digital enhancements, from embedding video to interactive campaigns. In October 2015 C21Media launched C21Mobile, a new app for tablet and smartphone that provides access to our news, features, audio and video content on the go. C21Mobile is available in the app store for iPhone and iPad, the android version is available via Google Play. You can download the iPad version by clicking here, and the iPhone version by clicking here. The Android version is available to download here. C21Mobile is fully integrated with the C21Media.net website and caches most recent content to allow stories, videos and audio interviews to be accessed offline. ClubC21 has become the hub around which the evenings at MipTV and MIPCOM turn. On each night of the market we host a networking beachfront club open from 6pm until 2am. More than 1500 people pass through the doors each night. The International Drama Summit is quite simply the most significant annual gathering of the global drama community. More than 1,800 key players from all corners of the scripted world, gather together for an inspirational three days that define the international drama business. The summit includes keynote interviews, commissioner briefings, producer masterclasses, buyer and channel showcases, genre workshops, craft sessions, territory overviews, development insight, showrunner one-on-ones, coproduction and finance workshops, director interviews, new drama screenings, networking parties, the C21 International Drama Awards, and so much more. C21Kids Content Futures takes place as part of Content London 2018, our four-day celebration of the world’s best entertainment. The event will provide a host of networking opportunities alongside stimulating sessions featuring some of the most active commissioners and producers of children’s content working in the business today. The Unscripted Entertainment Forum is part of the Content London three-day event. This one-day conference brings together producers, distributors and broadcasters to discuss trends and opportunities in factual entertainment programming from around the world. Launched in 2016 after the success of The International Drama Summit, Drama Summit West connects the US and international drama business to facilitate new production, coproduction, finance and creative partnerships. During this one-day conference, screenings and coproduction event up to 400 leading players come together to discuss next generation drama business and showcase the very latest projects making waves in the global market. Launched in Fall 2014, an exciting time for the genre, Drama Quarterly is for and about the international business of drama. From interviews with showrunners, writers, directors and on-screen talent to in-depth analysis of commissioning trends, project financing, digital strategy, market and sector reports. DQ brings perspective and further understanding to this renaissance business.